In 1870, two years after the Fourteenth Amendment was ratified, guaranteeing freedpeople rights as U.S. citizens, Congress responded to racial violence in the South by providing additional constitutional protection for the black electorate. The Fifteenth Amendment declared that the right of U.S. citizens to vote could not be abridged or denied by any state on account of race, color, or previous condition of servitude. But the Fourteenth Amendments inclusion of the exclusive word male to delineate rights under the Constitution and the Fiftheenth Amendments failure to provide women with the right to vote split the old abolitionist movement and provoked the creation of an independent womens rights movement. Some advocates of womans suffrage turned to racist arguments in pursuit of their cause. 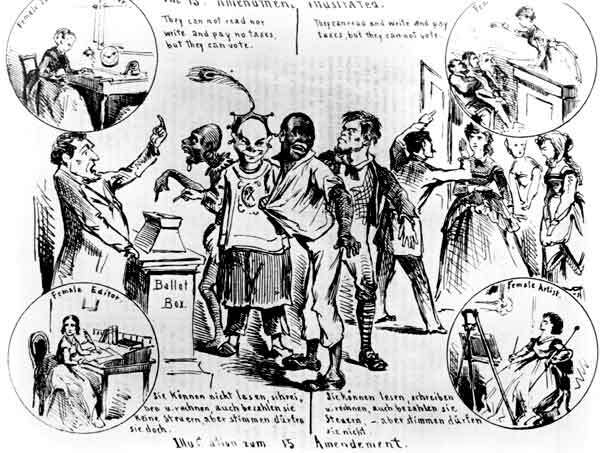 A cartoon in an 1870 edition of Die Vehme (The Star Chamber), a short-lived St. Louis satirical weekly, supported womans suffrage at the expense of African Americans, Chinese, and illiterate European immigrants. Source: Joseph Keppler, Die Vehme, April 2, 1870American Social History Project.